"I was so inspired by the Martha Moments posting about the Chubby Hubby Feedback cards I began plotting how I would create my own version. I made a few minor edits to the Chubby Hubby text but decided to change the formatting and size significantly. When I sketched out the cards in their original dimensions (standard business card size) I realized they were much too small. I thought the square shape and larger size was considerably more distinctive. I designed what I wanted and sent it to a local printer that I know and trust. I special ordered the boxes from a great company in Tennessee called Nashville Wraps (www.nashvillewraps.com). This year all of my presents were covered in an icy blue paper with cheery red satin ribbons. Needless to say the Feedback Cards were a huge success this Christmas. Now I find myself wondering what I will do next year..."
To make it all the more wonderful, Ryan sent me a package of his beautiful cards, wrapped as described above. I took some photos, below. You really do meet some great people in this ethereal world of broadband! Ryan's cards measure 8 centimeters by 8 centimeters and are kept in a sturdy cardboard box with a lid. They were sealed with an explanitory strap describing the purpose of the cards: essential when giving them as gifts. There are four variations of the cards. Simply circle the adjective that best describes the meal and leave it for the proprietor. 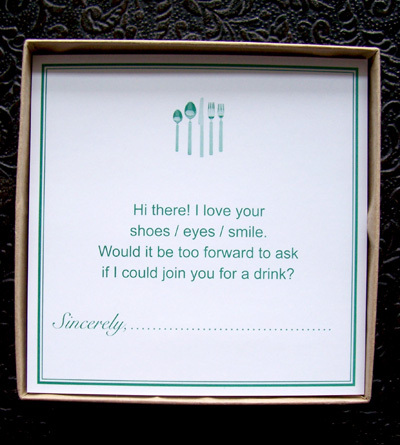 If restaurant flirtation is more your game, well, there is a card for that too! 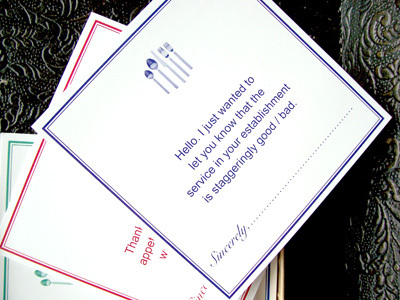 For more about restaurant feedback cards, see the 'PROJECTS' link at the right side of the webpage. 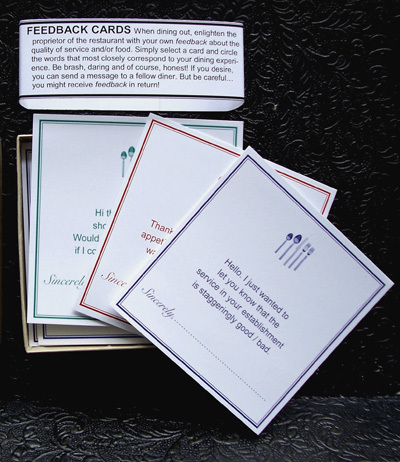 What a wonderful idea, and a great gift, too. I learned about Nashville Wraps from Alexis Stewart's excellent blog...they have wonderful stuff, and a cool catalog. Your blog is great...I check back often just to see what is new! Thanks for all the hard work you must put into it!